I've just been down to our local psychic fayre, not for a reading, but to take some pictures for a website I'm working on for talented psychic medium, Kim Worgan. The site, www.kimworganpsychicmedium.co.uk is still under construction but if you're in the market for a reading, her contact details are on there already. Kim is a lovely lady; she has done several readings for members of my family and they have been amazingly accurate. She's not at all 'Gypsy Rose Lee', but very approachable and friendly and has a remarkable gift. She recently travelled on a psychic pilgrimage to Nepal and had some amazing experiences and we really want her to get started on a book to share them with everyone. 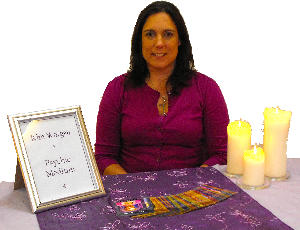 Kim Worgan mainly works in the Hampshire, Berkshire & Surrey areas, but if you are based closer to Devon, I know of another talented psychic you might like to try. Her name is Lorraine Holloway-White and she has her own psychic blog where you can contact her by leaving a comment. She is another very interesting lady with a lot to say. If you're on Twitter, try lorryholly.